Tamashii Nations 2018 is just around the corner, and thanks to the official @t_features twitter we have confirmation of the two tokusatsu exclusives for the show. First up is a repaint of the well received Shinkocchou Seihou Kamen Rider 1 S.H. Figuart in Sakurajima colors. Since Tamashii seems to be working backwards from the “Shin Rider 1” design, how long until we get Hongo in his original colors? Rider 1 will retail for 6480 yen. “Oh no!” The Black Hazard arrives continuing the pattern of black repaint event exclusives with S.H. Figuarts Kamen Rider Build Rabbit/Tank Hazard Form! With Hazard confirmed at last, could we see Rabbit/Rabbit or Tank/Tank as well as Genius on the horizon? Here’s hoping. Hazard Form will retail for 6480 yen as well. Both exclusives will be available at Tamashii Nations 2018, October 26th-28th. Boom! Studios has just revealed a brand new Mighty Morphin’ Power Rangers #25 Variant that will be available exclusively at Denver Comic-Con! This exclusive variant cover features Lord Drakkon in his Evolution 1 form. A new form he achieved after having obtained a Samuraizer, and having absorbed the energy of the Power Rangers Samurai within. As Lord Drakkon continues to grow in power and absorb more pieces of the Morphin’ Grid, could we see his further evolution’s on future variant covers? We certainly hope so! Denver Comic-Con will be held at the Colorado Convention Center in Denver, June 15th-17th. This exclusive MMPR #25 variant will be available there, at the Boom! Studios booth. 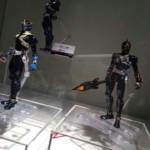 London Toy Fair 2018 – 1st Image of Legacy 6.5″ Red & Blue Psycho Rangers! We’ve only just begun reporting our findings from London Toy Fair 2018, but unfortunately the entire Bandai Power Rangers display is currently under a photo ban. Which is pretty typical for these events and held true at last year’s London Toy Fair as well. However, someone at the show was apparently daring enough to snap at least one picture., and this is kind of a big one. Now we have our very first look at the Power Rangers Legacy 6.5″ Red & Blue Psycho Rangers! TokuNation user thedangerranger was kind enough to share this image on our forums. From what we can gather, these figures are not in a prominent area of the Bandai UK display space. Given that they aren’t even standing up properly, it’s even possible they may have been totally overlooked. From what we can see though the sculpt looks on point for both and each appears to include their appropriate weapon as well, Red’s Psycho Sword & Blue’s Psycho Axe. When and if a better look at these figure from the event becomes available we hope to be able to share it with you! 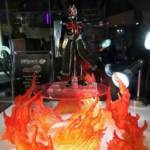 Just when you thought we were done, the hits from Tamashii Nations 2017 just keep on coming. 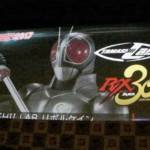 As you might recall, Bandai was teasing a big announcement for Kamen Rider Black RX and Den-O at the event, we’ve already gotten our Den-O announcement in the form of that new action figure revealed a day ago, and now it’s Kamen Rider Black RX’s turn! Many have speculated the release of an S.H.Figuarts Kotoaro Minami, or a Complete Selection announcement. And while it might not be the former, what we do have is Tamashii Lab’s replica of Kamen Rider Black RX’s signature weapon: The Revolcane on display. In addition to that, we have our first look at prototype S.I.C Kamen Rider Amazon Alpha, along with a plethora of new S.H.Figuarts Kaiju from the Ultraman series. 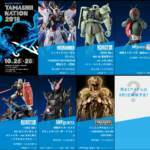 Tamashii Nations continues to be an ongoing event which just opened to the public. There’s still lots more news from this event to come, so be sure to check back with us for more updates. The last big reveal of the day comes from the beloved Kamen Rider Ex-Aid series. Shown off on display is none other than the final boss himself – Kamen Rider Cronus! Displayed with a Gamer Driver (aka Gamer Driver version), Kamen Rider Cronus looks absolutely glorious. UPDATE! New image with Bugster belt courtesy @EDxie3 on Twitter. The Shinkocchou Seihou series of S.H. Figuarts has the design process starting with the bone structure of the character and building up, providing more realization without limiting articulation. 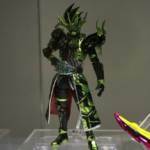 At the Tamashii Nations 2017 event currently happening in Japan, images have leaked of the Shinkocchou Seihou version of Kamen Rider Wizard! Currently, two images are linked to this article courtesy of @YongouOYander on Twitter. Check out the new version of Kamen Rider Wizard by clicking the title of the story. No further details on this figure are available at this time – it is simply on display. 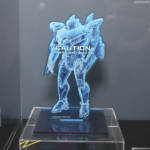 Tamashii Nations 2017 Teases More Soul Of Chogokin Pacific Rim Releases! Fans of the 2013 Kaiju/Mecha action film PACIFIC RIM have been hoping for some new & improved merchandise ever since Bandai took over the license. The first such wish has apparently been granted thanks to the marvelous Soul of Chogokin figure series, with a beautifully-recreated Gipsy Danger figure scheduled for release in early 2018. But it seems there may be OTHER Soul of Chogokin releases on the horizon for Pacific Rim! The Tamashii Nations 2017 display room has mock-up displays for two more Jaeger releases: Cherno Alpha & Striker Eureka! Sadly, no other information about these potential releases is available at time of writing. But feel free to join in our Ongoing Tamashii Nations 2017 Discussion Thread to share your thoughts on these (and other) new reveals!